This really is a fun kit for over 10 year olds, where they can become "crystallographers" for a day and learn how to make their own rock crystals and multicolored crystal trees. Everything, including safety goggles and gloves come with the Krazy Krystalz Kit and it does require adult supervision because of the use of hot water and chemicals. 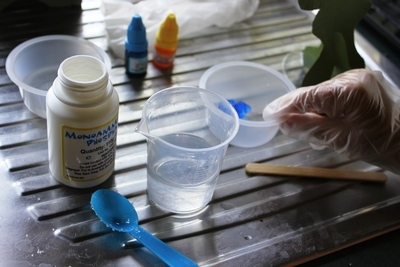 Once you've donned gloves and goggles, which is fun in itself, you can begin to experiment with the chemical mix (monoammonium phosphate). For us it was interesting learning how to make the solution "saturated" which is the ideal condition for the crystals to begin to form. It then took about an hour for some small changes to occur and after two days, we had some unique fully formed crystals (wow). 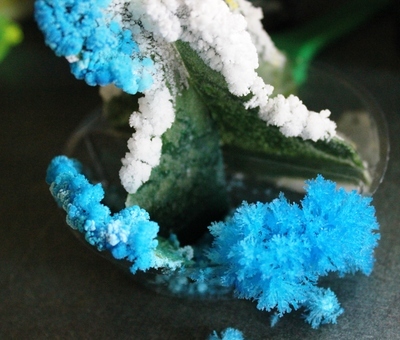 Another educational experimental part of the kit is creating crystal trees. The kit contains green cardboard, which you must cut into a tree shape, then mix your monoammonium phosphate solution to saturation point and pour it onto the "roots" of the tree. After only a few hours, we had amazing crystal trees and the kit came with colored dye to test with different color "leaves". 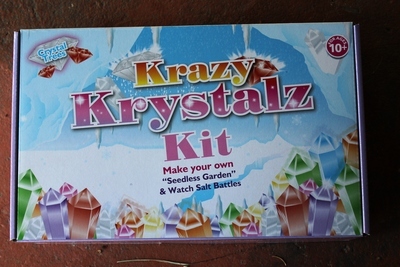 The whole Krazy Krystalz Kit is a great activity, but it requires patience and you need to read the instructions very carefully before you begin.